It is now becoming repetitive. Former Finance Minister P Chidambaram (PC), his friends and crony officers are known for their not-straight activities. They have been hounding Enforcement Directorate’s (ED) Joint Director Rajeshwar Singh for the past several years after Supreme Court (SC) appointed him as the Investigating Officer in 2G Scam and Aircel-Maxis cases. What is interesting is that the hounding continues even after the Bharatiya Janata Party (BJP) Government came to power in May 2014. The new government has been dragging its feet on his promotions, citing a series of objections, looking the other way while fake cases are being engineered and filed even in the Supreme Court. This new complaint by a new PIL activist is a pathetic rehash of old allegations and for effect added Rajeshwar Singh as also being a “threat to the sovereignty of this country”!!! Absolute drivel. It is interesting that the recent complaints have come from a top Central Bureau of Investigation (CBI) officer, who is allegedly a mole of PC and Ahmed Patel. Most of such fake complaints were passed through his vetting. After Chidambaram’s benami petitioner and fixer Editor Upendra Rai ran away by withdrawing his complaint in the Supreme Court (he is cooling his heels in Tihar jail currently), a new one has filed another fake complaint in the Supreme Court with the same set of frivolous allegations on June 5 in SC’s Vacation Bench. The petition was filed the same day when Rajeshwar Singh and his team were interrogating Chidambaram at the ED’s office in Aircel-Maxis case. The worst thing about the current petition is that the new petitioner alleges that Rajeshwar Singh is a “threat to the sovereignty” of the Nation! It is still a mystery as to why the Government lawyers Assistant Solicitor General (ASG) Maninder Singh and an old UPA appointee R. Balasubramanian known as R Bala kept silent on this frivolous petition. R. Bala, a veteran Army Officer turned lawyer is a close friend of Chidambaram and continues to be in the Government panel! This shows the networking power of Chidambaram. Earlier complaints allege Rajeshwar Singh as having thousands of crores worth of assets. As a matter of fact, Singh has been fighting service cases with the Government since 2012 and still, his latest promotion is pending. And if he has thousands of crores in assets then why should he be in Government service and fight cases? This new complaint by a new PIL activist is a pathetic rehash of old allegations and for effect added Rajeshwar Singh as also being a “threat to the sovereignty of this country”!!! Absolute drivel. The very first fake complaint was generated against Rajeshwar Singh was in late 2010, when he summoned controversial lobbyist Niira Radia. The persons behind this were none other than tainted Sahara Group owner Subrata Roy and his cronies Upendra Rai and Subodh Jain. All have been slapped by the Supreme Court for Contempt Charges for carrying out malicious activities in 2011. After seven years, in March 2018, when Supreme Court ordered ED to finish up the Aircel-Maxis probe in six months, the same gang member Upendra Rai rehashed his old petition and approached SC for taking action against Rajeshwar Singh, alleging that he had amassed huge assets. Rai withdrew his complaint after being caught by the CBI and is now cooling his heels in Tihar. Even after this Finance Ministry top officials Shakti Kanta Das and Hasmukh Adhia conducted service cases against him up to Supreme Court and got slammed in each forum. Judging from the amazing similarities between the new complaint and the one Rai had filed, it does not take Rocket Science to conclude that this fake complaint too was generated by Chidambaram to put Rajeshwar Singh under pressure. 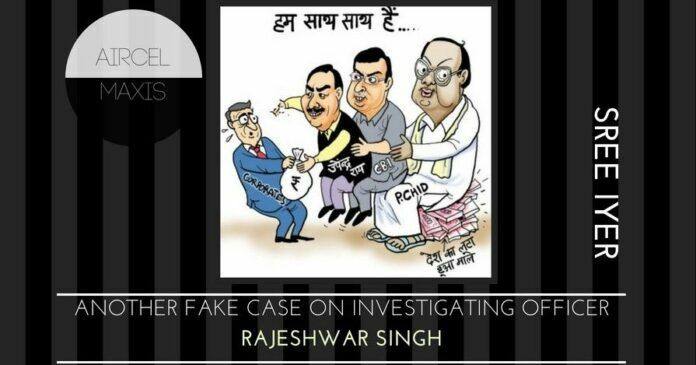 Being credited for exposing Chidambaram family’s illegal assets of over three billion dollars across the Globe, it appears as though Rajeshwar Singh has earned too many enemies. The currently indisposed Finance Minister (FM) Arun Jaitley (Piyush Goyal is the current FM), who is close with Chidambaram was also not favorably disposed towards Rajeshwar Singh. For the past four years, the Finance Ministry has been trotting out one objection after another on why he cannot be promoted. Clearly, the Finance Ministry under Jaitley was religiously following Chidambaram’s Order in 2013 to remove Rajeshwar Singh from the ED even after the Union Public Service Commission (UPSC) absorbed his service in the ED. Even in BJP leader Subramanian Swamy’s case, the Finance Ministry lied in the Supreme Court that there was no need for Rajeshwar Singh to be in the ED and that he may be sent back to his parent cadre and even blatantly lied that all probes of Arcel-Maxis had ended. This wrong statement by Finance Ministry was filed to Supreme Court in September 2014 and the Government got slammed by SC and order was issued to permanently absorb him in ED in three working days. “I wonder, how my Government made this statement to save Chidambaram,” shouted Swamy in Supreme Court that day. Even after this Finance Ministry top officials Shakti Kanta Das and Hasmukh Adhia conducted service cases against him up to Supreme Court and got slammed in each forum. It must be remembered that for Finance Ministry’s case against Rajeshwar Singh was conducted by Chidambaram’s close friend and his appointee Advocate R Balasubramanian, known as Adv R. Bala. R Bala is the person who from UPA’s tenure was appearing against Rajeshwar Singh, at the behest of Chidambaram in matters related to his service issues from Central Administrative Tribunal (CAT) to the Supreme Court of India. It is interesting to note that the same Adv R. Bala was present along with ASG Maninder Singh in Supreme Court’s Vacation Bench on June 5, 2018. Why did the duo keep quiet when the new Writ Petition was filed in Supreme Court against ED’s officer Rajeshwar Singh? They should have objected vociferously as it is their job to protect the Government officer. But they just kept quiet and forced the court to issue a notice. What R. Bala did was unethical. He was the Advocate from Chidambaram’s tenure in Finance Ministry and has argued against Rajeshwar Singh in his service case and now he as Government panel lawyer (still continues in BJP Government!) is present in Vacation Bench and kept quiet to get notice instead of arguing for the Government officer. R Bala is the person who from UPA’s tenure was appearing against Rajeshwar Singh, at the behest of Chidambaram in matters related to his service issues from Central Administrative Tribunal (CAT) to the Supreme Court of India. His name appears in the Dec 24, 2013 Judgment of CAT and 6 hearings before the Delhi High Court on Feb 6, Oct 10 (both 2014) and Jan 15 and Apr 15 (both 2015). On whose instructions is Bala representing the Government? The Supreme Court was hoodwinked into passing an order to hear this frivolous petition engineered by Chidambaram and his cronies. Chidambaram’s friend R Bala deliberately concealed the material facts and did not reveal to the Supreme Court the earlier relevant orders passed for safeguarding the officer. Was this deliberate? There is worse to come. One pliable senior journalist covering Supreme Court was deputed by the Chidambaram gang to report on this. Though the Court has not passed any specific order, except tagging this frivolous petition to the 2G bench, the senior crook journalist reported in a malicious way. In this current episode, the role of Finance Secretary Hasmukh Adhia is also dubious. After 20 days of rejuvenation at Yoga Centre in Mysuru, he seems to have not changed his ways. For the past eight months he has been sitting on the promotion file of Rajeshwar Singh as Additional Director. It is learnt that he and Rakesh Asthana tried to create fake complaints against Rajeshwar Singh in November 2017 and the Supreme Court has barred this malicious move. All this happened after Rajeshwar Singh attached Karti’s bank deposits in Aircel-Maxis case and revived the probe. Rakesh Asthana was sitting on Aircel-Maxis case for the past two years and saving Chidambaram till the CBI Director Alok Verma overruled him and arrested Karti in INX media case also. Hasmukh Adhia was delaying and playing all tricks to register cases under Black Money and Benami Acts against the illegal property amassment by Chidambaram’s family. The million dollar question is how Chidambaram overpowered these Gujarat cadre officers? It is a known fact that Upendra Rai had a very close relationship with CBI’s controversial Special Director Rakesh Asthana. It is crime on the part of Asthana to keep in touch with Upendra Rai, who for the past three years has been in the CBI’s list of Undesirable Contact Men (UCM). How can a CBI Special Director entertain a UCM? For the past two years, Rakesh Asthana was allegedly indulging in dirty tricks to sabotage the Aircel-Maxis probe to save Chidambaram and Ahmed Patel from Sterling Biotech diaries. Asthana’s name also figures in Sterling Biotech diaries for accepting Rs.3.8 crore from the business firm close to Ahmed Patel and CBI’s FIR names the role of Ahmed Patel’s son-in-law Irfan’s role in distributing money to accused Income Tax officers. Has Rakesh Asthana gone Rogue? The fact of the matter is that the thieves are right on the ship. The Gujarat cadre officers’ secret links with Ahmed Patel is really hurting Narendra Modi Government’s moves against corruption. For the past seven years, the Supreme Court has been stepping in and preventing malicious actions being taken against an honest officer Rajeshwar Singh. And diabolically, the Government lawyers Maninder Singh and R Bala keep silent when another fake petition gets filed before the Supreme Court, that too before its Vacation Bench. Had Chidambaram gang instructed them to act like this? Instead of alerting the bench, by their silence, they were fooling the SC Vacation Bench. Provoked on these developments, BJP leader Subramanian Swamy on Wednesday tweeted that a Gang of Four officers was trying to sabotage probes against Chidambaram by maligning honest officers like Rajeshwar Singh. This information’s are not convincing logically and rationally. You are involving the group of two parties who are absolutely opposite each other and bureaucrats are spineless animals, they don’t have guts to lie before the judiciary. Your information picture there may wheels within wheels but the operation may belongs to one party i.e. Ruling party nothing else. Therefore your info is misguiding, unfounded, vague and partial. When BJP came to power in 2014, one great expectation from people of India, was end of high level corruption and early prosecution/punishment to such people. But, BJP failed miserably in this reg. All big fraudsters are roaming in India/abroad without any worry. Their still continuing coteries in important ministries/office are taking care of them. That is the tragedy. Inaction by FM and silence or non-interference by PM will definitely bring bad name to BJP as people who voted BJP to power are feeling terribly frustrated over the issue of corruption. Modi should attend to this case immediately and ensure speedy prosecution and protect the honest official handling the case. Otherwise he will be relegated to theposition of a weak leaser who cannot deliver. Both Adhia and Asthana are from gujurath and known to Modi. If they are siding chidambaram , do you think modi would support them?. I think your observation requires furthur research. But, Shri Gopichand, equally don’t forget Ahmed Patel is also from Gujarat and ultimately it’s money that talks as these corrupt officers won’t get anything from siding with the truth and Modiji whereas by siding / supporting PC and AP, they can earn so much that their 3/4 generations can enjoy life without working! So pathetic.It is known that present FM is bending backward to protect the former corrupt FM but the 56″ PM probably has forgotten that he is Prime Minister whom the People elected with Enormous Faith and Trust. I don’t expect a crisp outcome in any of these cases. In a country of 125 crore people and thousands of officers, if only one can be relied upon to carry out honest investigation, we must look at our basic principles and practices. I cannot really imagine a non-corrupt party or a person being at a high level anywhere. You can go on feigning shock and wonder. I am impressed with your focus and perseverance, but not with your premises. Mostly these AGIs SGs and ASGs are compromised, its a big ongoing, money spinning racket in our judicial system. pertinent to state here, in a Supreme Court SLA (C) No 4574 – 4575/ 2015 Mr. Mukul Rohatgi was representing Prasar Bharati while his niece Ms. Ranjeeta Rohatgi was appearing on behalf of the Respondent BCCI along with Mr. Amit Sibal . Eventually Prasar Bharati lost this appeal vide an judgement dated 22 August 2017 . It was observed during various hearings that Mr. Mukul Rohatgi deliberately had this matter let go and failed to put across citizens interest. Very detailed , good article sir .What good we can expect from Modi that too in last 9 months. I feel cheated. This is how honest officers are attacked by the corrupt gang. The corrupt people gang up and they have no ideology. It is unfortunate that honest officers are victimised by the uncouth people. I can only derive a shocking conclusion from this article, Shree Iyer: Even if Modi forms the Government in 2019, Finance Ministry, ED, ITO, CBI will still be functioning with Chidambaram as their BOSS. In other words, neither Chidambaram nor any of his family members can be touched. If PC comes out from the clutches, then Modi Govt is gone case. They need to mail him down and so as Ahmed Patel, Tharoor, Sonia and Rahul. Modi Govt has no other option as these are made big in media and if this fails, it will be a big embarrasment for the Govt. Previous day, I hd tweeted that “how many Complaints/PIL, against Dr. Rajeshwar Singh, has been filed so far…? It seems that only corrupt people are running the present Govt. That’s why A2 (Asthana+Adhia) kept the file (Promotion file of Dr. Rajeshwar Singh) under their cution till today. Swami too screems out for that. when SC has asked to officers concerned to promote him, why the hell they are not ? By doing some activities like fake PIL, SC has to order to put these people behind the bar for filing any PIL so as to interfere the 2G case . Generally, it is a case of “Contempt of Court”….Keeping the promotion pending so that they can file so many complaint against him. Foxy !! Clever enough….hummm 😉 To destroy 2G, A2 is there. Thanks for exposing the rot in the Ministry of Finance.Request Pgurus to take up the matter with PM. Thanks for exposing the rot in the Ministry of Finance.PM should be informed urgently by Pgurus. Why PM MODI is keeping silent.Safeguarding honest Govern mentioned officers is his prime Dharma.When so much is in public domain he should act fast . How terrible. Hope PMO takes cognizance of these issues and takes appropriate action immediately. If BJP had to action against Chidambaram and his agents , they would have done so by now. This is all a natak by Modi Government.